Technological advancements continue to outpace all expectations. I’m sure readers are well-aware of facial recognition technologies being developed and deployed around the world in all kinds of security and personal identification applications, but there is now one more ID recognition system which is also now being implemented. China has been implementing facial recognition technology all over its nation to be able to track and locate its citizens on a 24/7 basis, but some people and some weather condition could foil the facial recognition software. For example, wearing a burka or mask would foil facial recognition technology as would weather conditions such as blizzards, rainy days, night-time conditions, etc. Extreme cold would induce some people to wear facial masks for warmth, and this action would also foil facial recognition systems. 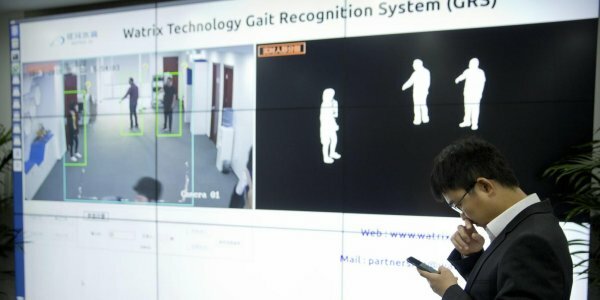 Therefore, China is also developing software utilizing Artificial Intelligence to identify everyone based on their “gait,” their body shape and manner in which they walk. China already has 170,000,000 closed-circuit TV cameras and is planning to install another 400,000,000 by 2020 (first link). Be sure to watch the embedded link inside the first link where a BBC reporter tested the system to see how quickly China’s facial recognition system could locate him in a city–the police were surrounding him in seven minutes. A Chinese official states the system can also follow your movements backward in time for a week and see who you interact with the most. It closes with a chilling comment that the goal of the system could also be to predict who will commit crimes before they are actually committed (this sounds like a Sci-Fi movie that was out a few years ago). The second link reports that Chinese authorities are already introducing the new “gait” technology in Beijing and Shanghai and that the USA, Japan, and the United Kingdom are also working on this same “gait” technology. The third link reports this system is already being used to apprehend people for such minor offenses as jaywalking. I suspect many readers will join me in concluding that this is a very sophisticated “Big Brother” technology. Where is all this leading? Let’s consider another modern identification/surveillance system being set up. The fourth link describes a new credit card payment system being introduced by MasterCard which uses biometric data (facial recognition and fingerprints) to enable its cardholders to make financial transactions via their smartphones (or possibly any “smart” digital device). MasterCard calls this new purchasing system “selfie pay.” The link is very interesting and adds that persons will have to “blink” so their smartphone will know it is now looking at a real person and not just a photo of someone. People with glasses and identical twins can pose problems for the “selfie pay” option so those people would need to use fingerprint identification to make purchases with their credit card. Think this is just futuristic? It’s already being field-tested in the Netherlands. Under this system, the article observes that “the person is becoming the password” for all financial transactions. Some are sounding the warning that these conveniences are coming with major privacy risks, such as false identifications of people being scanned, using biometric metadata to market your habits to advertisers, a “police state” monitoring system, etc. (fifth link). These developments have huge implications from the perspective of biblical prophecy. Revelation 13 describes details about a regimented “big brother” system that will come into being in the latter days just prior to the return of Jesus Christ. In verses 16-17, it specifically states that this global system will require everyone to present some kind of identifying, feature, in their hands or foreheads in order to implement financial transactions. Keep in mind that the Apostle John, who wrote the book of Revelation, was seeing our modern times in a vision and he had to describe what he was seeing in our futuristic society in the vocabulary of his ancient language. In his vision, he was seeing that people all over the world were making financial transactions via some kind of use of their hands or faces. His prophecy describes very well what he would have seen if he saw an economic system where financial transactions were being made via hand-held smartphones using biometric authentication involving either fingerprints or facial recognition technologies. This prophecy is proving to be right on target, and the fact that it was authored circa two millennia ago confirms that only a Creator God who can foresee and control the future could have inspired such a precisely accurate prophecy. God challenges everyone to see his reality and sovereignty in the fact that he can make prophecies and bring them to pass in the future at their appointed times of fulfillment (Isaiah 41:21-26, 46:101-11). Do you think this was just a lucky guess by an ancient writer? Consider the following facts. Zephaniah 2 prophesied that just before the “day of the Lord” (verse 1) comes, the Jews (“Judah”) will establish a new nation of their own in the old Promised Land that would include the coastal Mediterranean region and the city of Ashkelon (verse 7) and that this new Jewish nation would have a lot of border conflicts (verses 8-9). This has been literally fulfilled from 1948 to the present. Daniel 12:4 prophesied a knowledge explosion would occur in the “time of the end,” and that it would be so great that only the people alive in the end times could possibly understand the scope of the prophecy. This has been literally fulfilled in recent decades. Revelation 18 prophesies that a global political/financial system called “Babylon the Great” will collapse and fall in “one hour” (verses 10, 17 and 19). This could only be fulfilled literally in a time when digital technologies have interlinked all global markets so a great crisis can collapse them all in a cascading fashion within one hour. That fulfillment is ahead of us, but it could happen at any time. Christians have wondered and debated about the “mark of the beast” for decades, but we now have biometric identification systems being implemented in the world that already utilize the hands and faces (i.e. “foreheads”) of people in order to make financial transactions (i.e. “buy and sell”). This “beast” technology now exists and is now being implemented globally. We do not need to wait to see what the “beast” technology of Revelation 13:16-17 will be. It is here already. However, while this prophesied “beast” financial purchase/ID system now exists, the global political/financial beast system does not exist yet. The modern world still has its long-entrenched political/financial system in place globally. Revelation 17-18 call it Babylon the Great and identify it as having been in place for a very long time (Revelation 17:1-6). This modern system is called the global Deep State or “swamp” or similar such terms in the modern media. This system has not yet been overthrown, but it is prophesied to be forcibly overthrown by a cryptic alliance of “seven heads and ten horns” (Revelation 17:7-18) who will act together to take down the current political/financial order. This prophecy could be fulfilled anytime via a financial crisis that befalls the earth suddenly, and prophecy indicates that trade and commerce will grind to a halt (Revelation 18). Since the technologies to implement the financial processing system foretold in Revelation 3:16-17 now already exist, it may not be long until the beast power comes into existence to implement a global financial system. Since the current system will have collapsed by that time, the nations will be only too happy to welcome a new global system which enables commerce to be restarted. Two things must happen before the beast system comes into being. The first is that the current Babylon the Great system must be overthrown as the prophecy in Revelation 17 explicitly states. The second event is revealed by mathematical analysis. The beast system is allotted only 42 months to exist in power (Revelation 13:1-7) before it is obliterated by the return of Jesus Christ at the head of a heavenly army (Revelation 19:11-20:4). Keep in mind the Bible is written from a Hebraic perspective so the months here described are lunar months which are slightly shorter than 30 days each so this reign of the beast will be less than 1260 days. However, Revelation 11 prophesies two human beings will be delegated divine powers to plague the earth “as often as they wish” (verse 6). Predictably, the overall world will not repent in spite of these plagues, and the beast will finally defeat and kill these Two Witnesses after their ministry of 1260 days ends (Revelation 11:3-7)). Notice that the Two Witnesses will have a slightly longer length of existence than the global beast system, yet the beast will kill the Two Witnesses and go on ruling the world system for an unspecified time until Jesus Christ comes to destroy it. Mathematically, this means the Two Witnesses have to arrive on the world scene before the beast system comes into existence. Since we already have the financial technology of the beast system being implemented into modern nations, this infers that the Two Witnesses may be coming on the scene in the foreseeable future. I hope God sends them soon! Once their ministry begins, we have known prophetic timetables that will begin to tick down to the end of this age. For more in-depth examination of topics discussed above, please read my free articles, Are We Living in the Biblical Latter Days?, Is Babylon the Great about to Fall…Ushering in a New Beast System?, The Two Witnesses and The Babylonian Origin of the Modern Banking System. Seeing that the Bible’s prophecies cited above have literally come to pass in our time, it is evident that a Divine Creator Being is implementing his prophecies just as he prophesied. Whether the nations and their leaders realize it or not, they are acting out a “script” which God set down millennia ago to be fulfilled in our time. If you would like to know more about God’s “script” that will be fulfilled in the years ahead of us, please read the above free articles and the other materials at my website, stevenmcollins.com.